Trigonometry allows us to find sides of triangles that we would not normally be able to find, by taking advantage of the sine, cosine, and tangent ratios. Now that we have stated the three trigonometric ratios, we can look at our examples (there are also three reciprocal trigonometric ratios: cosecant, secant, and cotangent. For now though, we will only use the three main ratios). Example: Find the missing side \(x\). Round to the nearest tenth. The value \(30.1\) was obtained by computing \(16\tan 62^\circ \) in a calculator. MAKE SURE your calculator is in degree mode!!! Remember to keep your calculator in degree mode! And remember to set up the appropriate trigonometric ratio for the situation! Find the missing side. Round to the nearest tenth. 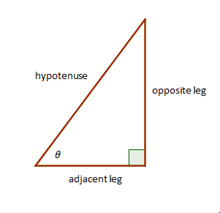 Find the measure of the indicated angle to the nearest degree.